GALION — Good friends, good music, good food are a winning combination. And that’s what’s going on at Heise Park this summer each Tuesday between June 5 and July 3. Music in the Park is celebrating it’s 10th season of free entertainment each Tuesday, June 5 through July 3 in Galion’s Heise Park. This concert series is presented with the compliments of Richardson Davis Chapel Snyder Funeral Homes on Market Street. To kick off the season, Colonel Crawford High School’s Vision choir will present a concert followed by Galion High School’s Showtunes Choir. In what will be the culminating presentation for the groups’ graduated seniors, each will perform routines they have practiced all year. This evening is a highlight of local talent in motion and song. On June 12, Jane Horton takes to the microphone. A recognized name to many, she is a life-long Galion resident, and a graduate of Galion High School. She tutored in the Galion school district for 12 years before launching her career as a country and country gospel singer in 1990. A popular wedding singer, she has graced the stages of local festivals, church platforms and is a special guest of clubs and organizations. Her husband Ben is her sound tech and manager. Randy Velez, described as the “Rich Little of Music” takes the stage June 19. Velez has earned the title thanks to a vocal range of five octaves and an uncanny ability to mimic voices. Although many think Velez is lip-synching or electronically modifying his voice during his programs, he uses no auto tuners or harmonizers. He keeps the show lively with the use of hats and other simple props. His repertoire includes oldies, crooners, ’60s, Elvis, Spanish, and disco. Even if you’ve seen his act before you are bound to hear something new. Read more about his show online at www.RandyVelez.com. Picnic with Randy starting at 6 p.m. June 18. Just before concert, come to the band shell behind the YMCA for a free traditional American picnic. The directors and staff of Richardson Davis Snyder Funeral Home will be grilling hot dogs, squeezing fresh lemon shakes, and more. And it’s all complimentary. The Big Daddy Blues Concert is June 26. This show will include music covering groups like Maroon 5, The Beatles and James Taylor. The rock, swing, soul and top 40 group creates a party atmosphere for every age group. A five-piece band with male and female vocals, Big Daddy Blues is dynamic and and plays music you can dance to. The group has paid its dues working the clubs and concert circuit along the West Coast. Based in San Luis Obispo, California, they have been the opening act for many blues and jazz artists including John Nemeth and Junior Watson, Jimmy Witherspoon, Honeyboy Edwards, and Ron Thompson and the Resistors. The 2o18 Music in the Park seasons wraps up July 3 with local band The Crazy Gringos. They are an energetic and eclectic band that performs everything from blues to classic rock to jazz, bluegrass and country. They’ll even throw in a little Gershwin thrown. The band features Eric Tilson on vocals, guitar, sax and harmonica; Galion attorney Steve Tilson on guitar, ukulele and banjo; John Erlsten, a Galion Middle School teacher is on the bass; and Roger Mayes on drums. Performing for the past 13 years, the Crazy Gringos have played from Lake Erie to the Ohio River. Each group member has a rich history of music performance in the area and they prove that together, this whole band is greater than the sum of its parts. 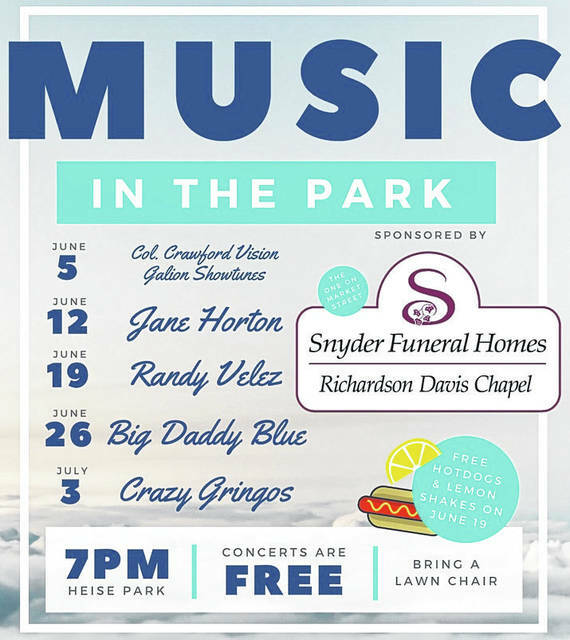 Each concerts start at 7 p.m., with the picnic on June 19 starting at 6 p.m. Bring a favorite lawn chair or blanket, some friends, and leave your wallet at home because this concert series is sponsored completely by Richardson Davis Chapel Snyder Funeral Homes on Market Street.